As I mentioned in my blog post on World Dragon Day, I intended to honour the Dragons that day by starting work on my Earth Dragon mask. 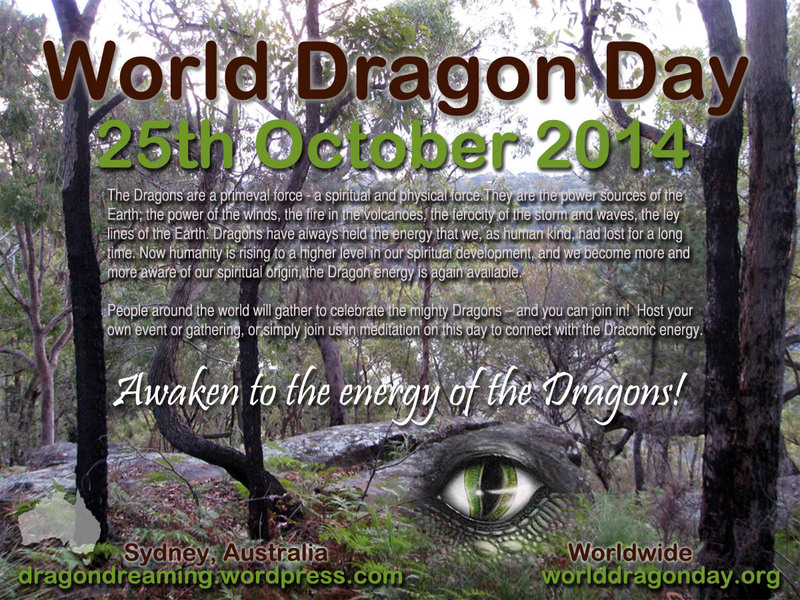 With this year being an “Earth year” for me and my Dark Moon Circle one of the banners I made for WDD also reflected that, with a Dragon’s eye peering out of a rock in a bushland setting (the photo was taken across the road from my house). 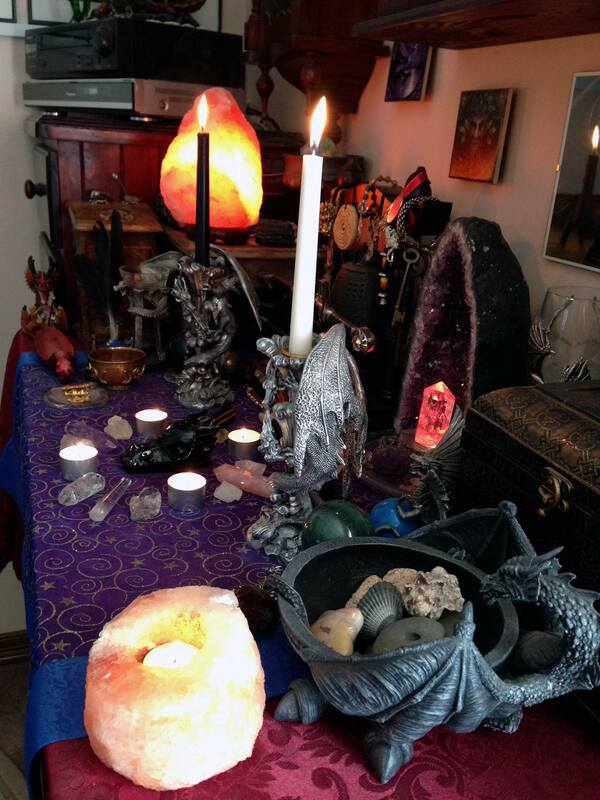 I began the day by setting up my altar in honour of the Dragons and meditated to connect with them, and to hopefully receive some more inspiration for my mask. 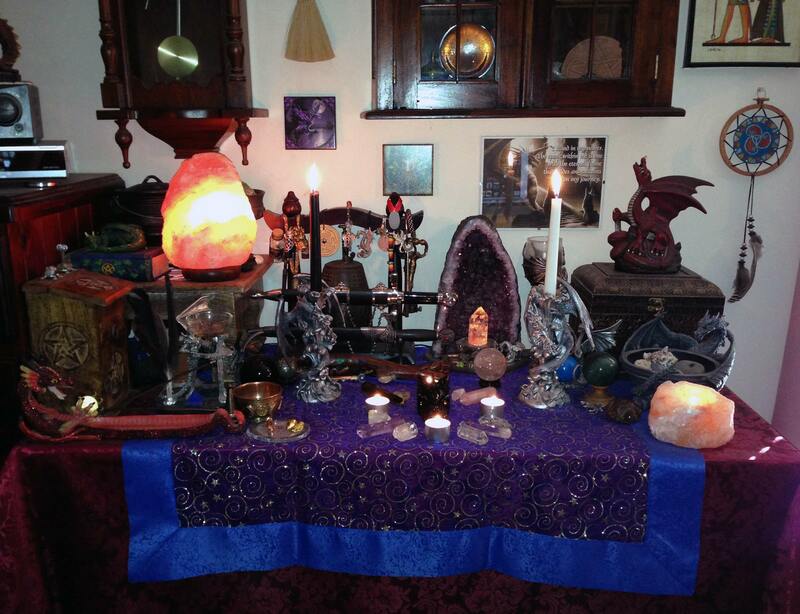 My altar on World Dragon Day, with my Obsidian Dragon Skull in the centre of a crystal circle. 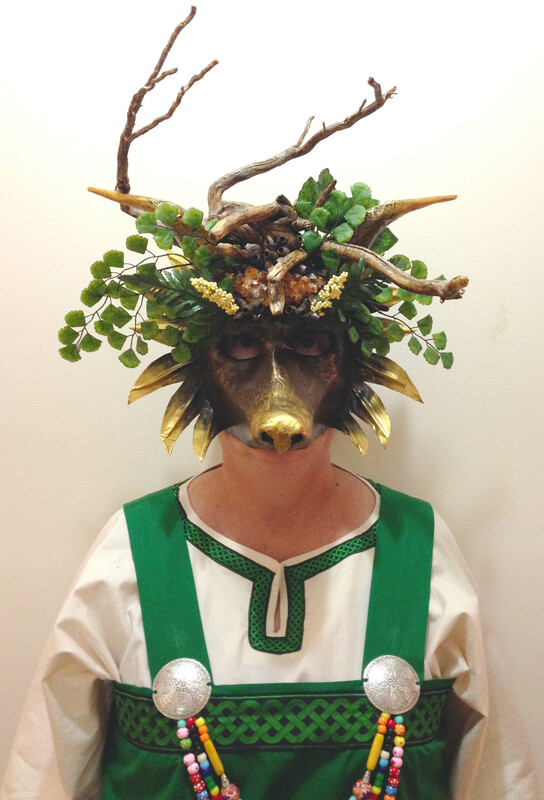 Next, I headed across the road to the bush to see what inspiration would come for my mask. I had a few ideas of what I intended to do to the basic plaster-coated paper mache mask to transform it into an Earth Dragon but I needed to find suitably sized and shaped sticks, twigs and small branches etc. I took up a collection from around the base of my favourite Angophora tree — Angophoras have smooth branches with interesting twists and turns in them — but none seemed quite right, though I set them aside in a neat pile anyway, hoping that I’d get some ideas on how to use them. A little further away from my favourite tree I also found the dried root ball of a small shrub that had been uprooted and probably dumped there from someone’s garden across the road as the main stems had been neatly cut with secateurs. However, something about it “spoke” to me as I carefully studied it from all angles. I had previously asked the Dragons to please lead me to find something useful and special for my mask, and I had a feeling that this was it! 🙂 So, armed with the small root ball, a selection of other sticks and a large collection of gumnuts I headed back home to begin working on my mask. Originally the mask was going to be painted green but after a couple of days I decided that brown would be more suitably earthy. I added some gold highlights to “lift” it a bit and to also represent the mineral found in the earth, the molten core of the Earth and heart of the Earth Dragon and also in reference to Dragons’ supposed love of hoarding gold and other shiny things. 😉 Finally, I also found a use for a collection of citrine points which had been patiently waiting in my box of craft supplies to become part of one of my artsy-craftsy creations. A few days later, after the basic construction of the mask was completed, I sprayed it all with a clear lacquer which also improved the look of the root ball wood which I had sanded, smoothed and reshaped slightly and attached to my Earth Dragon mask. 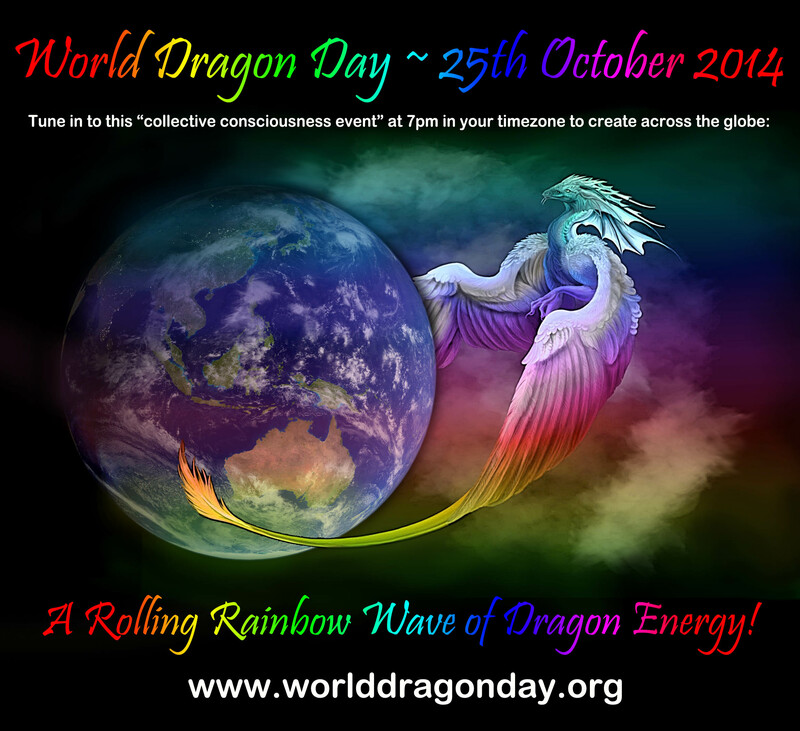 All this work had been done over 6 days, beginning on World Dragon Day but I was going to leave the final stage to do at my Pagan group’s Beltane gathering on the Saturday following WDD, as mask making is one of the activities we do at this weekend retreat every year. I like to get a head start on my mask so I can have it finished in time for the Saturday evening ritual and the group photo the next morning. 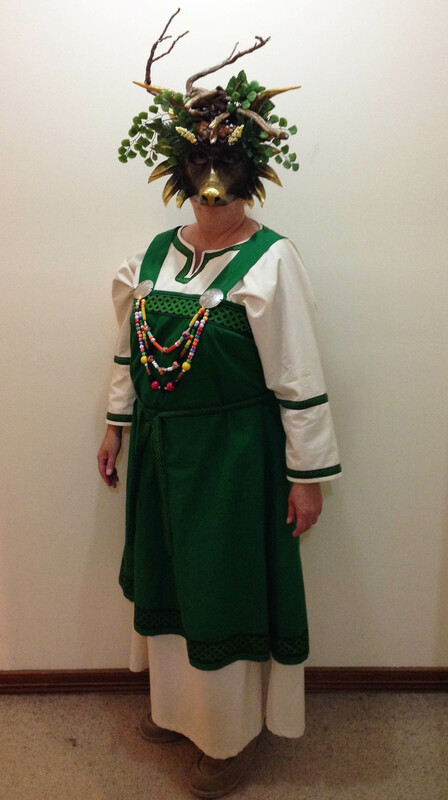 My group’s theme this year was Viking attire so we had fun either making our own costumes or sourcing ready-made ones online. 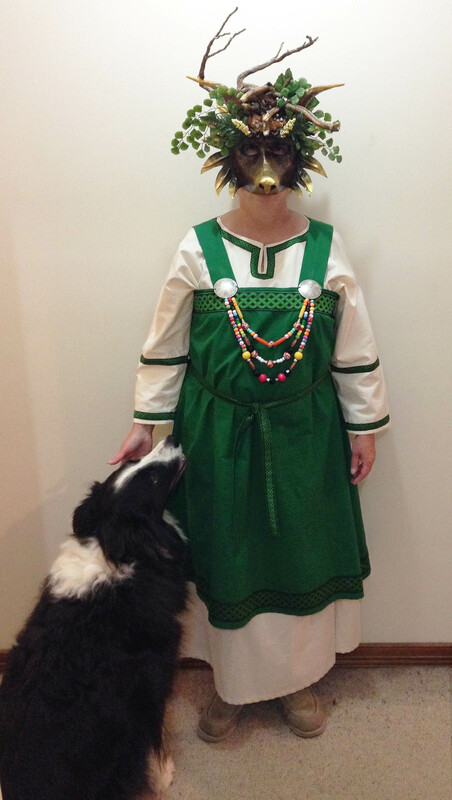 I opted to make my own “historically accurate” costume comprising a Viking woman’s underdress and the hangerok decorated with beads. Although, instead of using woollen fabric like the real Vikings would have used, I thought cotton would be far more suitable for Australia’s late spring climate. It was just as well because we had a record-breaking hot day for this time of year, along with a total fire ban which meant we couldn’t have our usual Beltane fire in the outdoor fire pit. Instead, we made do with a small cauldron fueled by methylated spirits and had it indoors. 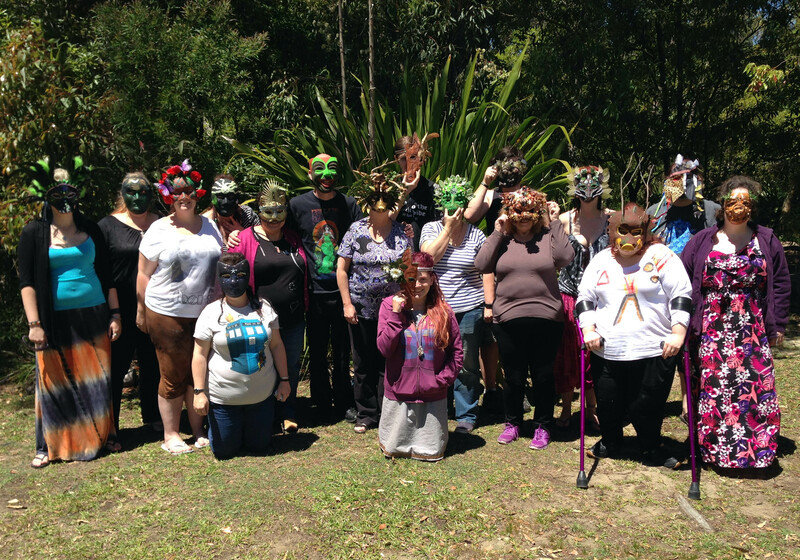 The next morning we took a group photo of us in our Dragon masks (though unfortunately not wearing our Viking gear). Here’s my entire collection. 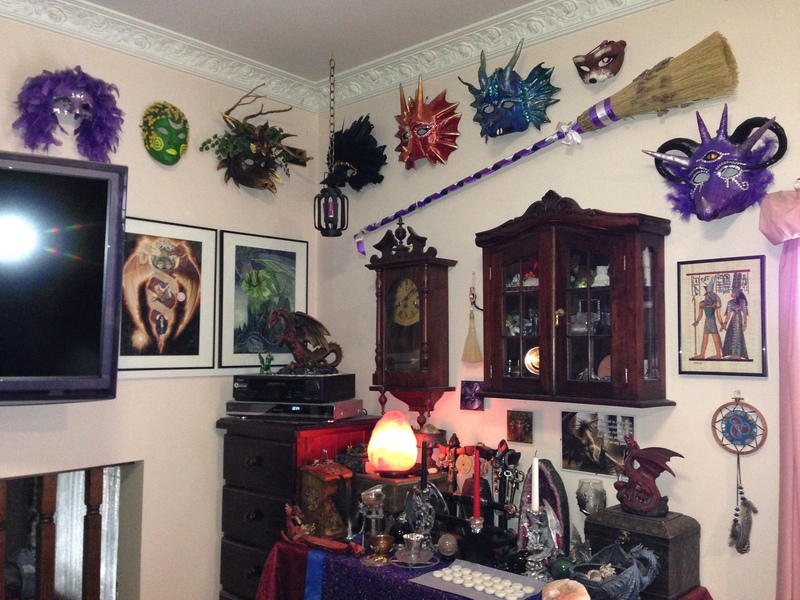 L to R: “Goddess” mask 2005, “Spirit of Spring” 2007, Dragon of Earth 2014, Raven 2010, Dragon of Fire 2011, Dragon of Water 2012, Fox 2008, Dragon of Spirit 2013. 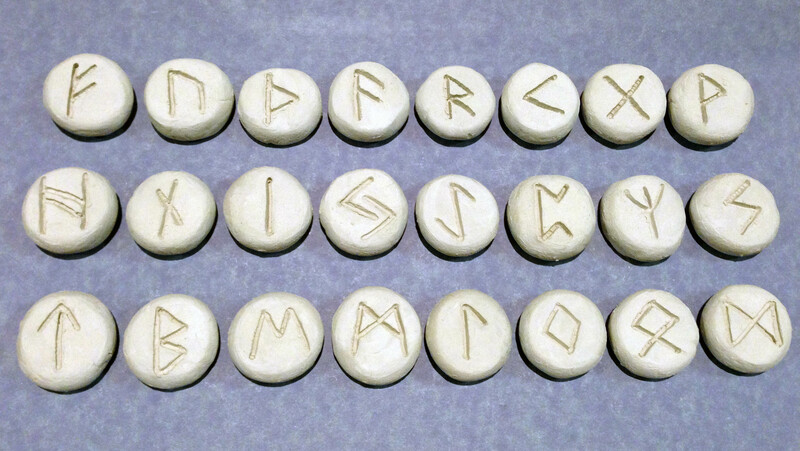 We also did a Rune-making Workshop at our Beltane Viking Weekend and mine can be seen here still drying on the altar. 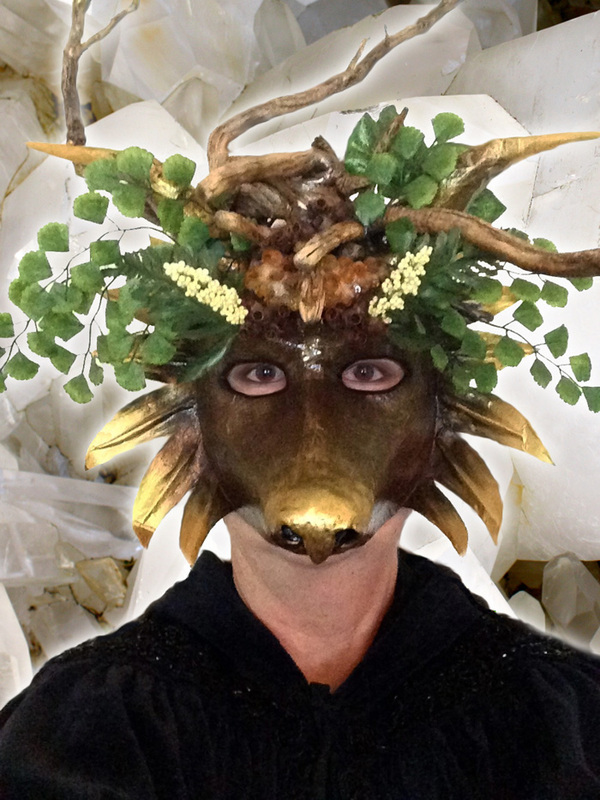 If you’re interested in mask making you might also like to read my blogs about my previous dragon masks —Dragon of Spirit (2013) ~ Dragon of Water (2012) ~ Dragon of Fire (2011). 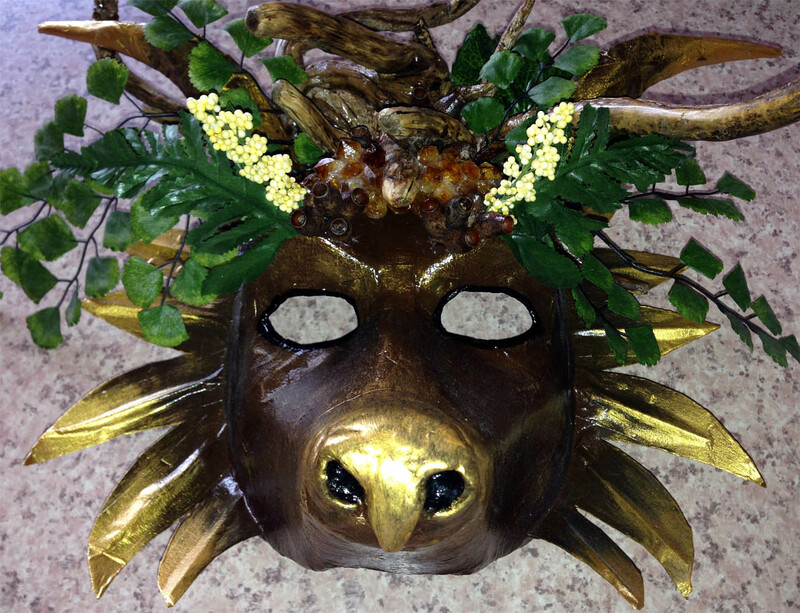 This entry was posted in Art & Craft, Magickal Tools and tagged Beltane, dragon, earth dragon, Earth Dragon mask, southern hemisphere Beltane, World Dragon Day. Though I am not very big into using plastic, I just might decide to try something like this anyway. Some of those would be good for a Shaman’s dance outfit. Very, very nice! Awesome stuff Topaz. 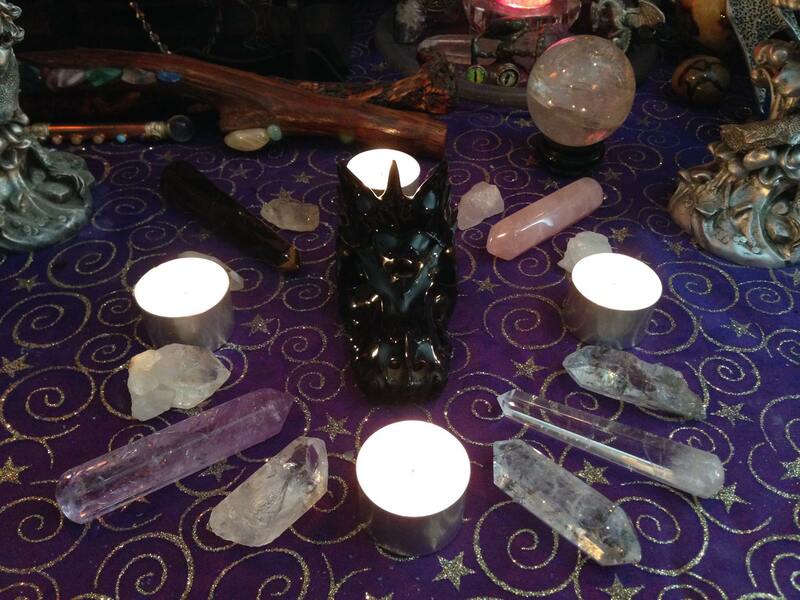 Like the alter, and the crystal grid grabbed my attention! Great blog post, as always. Enjoy. I wonder what a Storm-Dragon mask would look like? My Spirit hails from the “Storm Clan” from time immemorial. Always used to know about the weather changing long before anyone else. Never knew why until many years later – when the memories came back to me.